But the extreme conditions on hot Jupiters worked to the scientists' advantage. "The day-night radiation contrast is, in fact, easy to model," Parmentier said. "[The hot Jupiters] are much easier to model than Jupiter itself." The scientists first created a variety of idealized hot Jupiters using global circulation models—simpler versions of the type of computer models used to simulate Earth's climate. Then they compared the models to the light Kepler detected from real hot Jupiters. Kepler, which is now operating in its K2 mission, was designed to register the extremely tiny dip in starlight when a planet passes in front of its star, which is called a "transit." But in this case, researchers focused on the planets' "phase curves," or changes in light as the planet passes through phases, like Earth's moon. Matching the modeled hot Jupiters to phase curves from real hot Jupiters revealed which curves were caused by the planet's heat, and which by light reflected by clouds in its atmosphere. By combining Kepler data with computer models, scientists were able to infer global cloud patterns on these distant worlds for the first time. The new cloud view allowed the team to draw conclusions about wind and temperature differences on the hot Jupiters they studied. Just before the hotter planets passed behind their stars—in a kind of eclipse—a blip in the planet's optical light curve revealed a "hot spot" on the planet's eastern side. And on cooler eclipsing planets, a blip was seen just after the planet re-emerged on the other side of the star, this time on the planet's western side. "We're claiming that the west side of the planet's dayside is more cloudy than the east side," Parmentier said. This led to another first. By figuring out how clouds are distributed, which is intimately tied to the planet's overall temperature, scientists were able to determine what the clouds were probably made of. The science team found that manganese sulfide clouds probably dominate on "cooler" hot Jupiters, while silicate clouds prevail at higher temperatures. On these planets, the silicates likely "rain out" into the planet's interior, vanishing from the observable atmosphere. In other words, a planet's average temperature, which depends on its distance from its star, governs the kinds of clouds that can form. That leads to different planets forming different types of clouds. "Cloud composition changes with planet temperature," Parmentier said. "The offsetting light curves tell the tale of cloud composition. It's super interesting, because cloud composition is very hard to get otherwise." 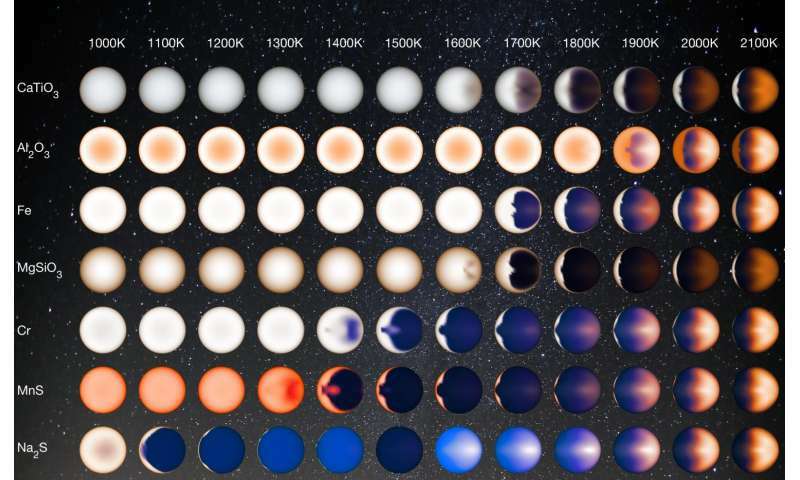 The new results also show that clouds are not evenly distributed on hot Jupiters, echoing previous findings from NASA's Spitzer Space Telescope suggesting that different parts of hot Jupiters have vastly different temperatures.